In the summer of 1969, the police raided the Stonewall Inn on Christopher Street in Greenwich Village, New York. The Inn was patronized by members of the city's LGBTQ community. During this era, homosexuality was often treated as a mental illness, homosexual relations had not yet been decriminalized in many places, and openly gay people were barred from federal jobs. Bars and restaurants could lose their license for serving to LGBTQ patrons, limiting the public spaces in which gay people could meet and socialize freely. 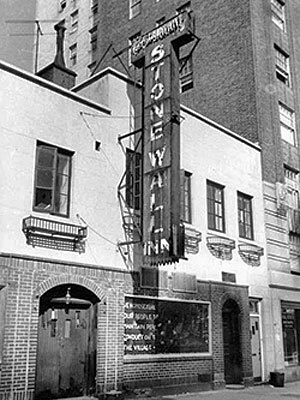 The Stonewall Inn was raided by New York City police on June 28, 1969, for operating without a liquor license. The officers then began arresting the patrons and employees based on a city regulation requiring individuals to be wearing at least three articles of “gender-appropriate” clothing. Onlookers retaliated and rioting took place outside the bar on and off for five days. The riots themselves faded away, but their legacy was powerful. Members of the LGBTQ community launched a new wave of activism that challenged the constitutionality of anti-gay and anti-transgender laws through the court system. Leaders of the movement connected with other civil rights movements and built new organizations to support those who had been marginalized and to advocate for equal rights. "The Stonewall Inn in 1969". Diana Davies, copyright owned by New York Public Library, Wikipedia. The Stonewall Uprising continues to serve as a symbol of the power of working together for civil rights even today. The year 2019 will represent the 50th anniversary of this event and its call to activism. Here in the Orlando community, we know how important it is to keep this spirit alive. As historian Monica Butler explains, "when an armed gunman murdered 49 people at Pulse night club in June 2016, thousands of mourners gathered outside the Stonewall Inn to honor those who lost their lives in the ongoing struggle for equal rights to life, liberty and the pursuit of happiness."